I have been too busy being cheerful to blog! I have a blanket on the go! My favourite thing to do as you all know! This one is for a new little baby boy, Kester, born just a few days ago. The second thing I don't have a picture for, but it is the light streaming through the windows (and my house isn't too dusty for a change) I'm not one who suffers in the dark winter months, but the sunshine streaming through the window is great for the soul! The third and maybe the most exciting one is that we are getting one of these. This is our new beagle puppy who we are going to collect in an hour and a half........I am quietly excited and nervous all rolled into one! He still doesn't have a name, we have a long list, but can't agree......any ideas? 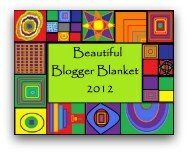 I have so much running through my mind and haven't found time to blog at all.......please check out Jill's (from Stocki) Beautiful Blogger Blanket. It is a simply brilliant idea that I can't wait to get going on (I know.....I know I must get on with it) .....its all about blankets, so you know I'm in don't you?! Why don't you join in too, the closing date is 31st January. Anyway.......I'm certainly very cheerful about that too.....why don't you pop over to PlanetPenny and join in the fun and spread some cheerfulness too. 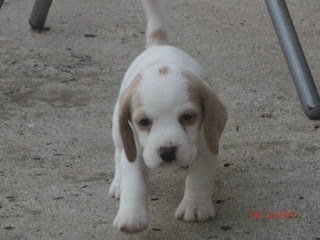 Oh he is sooooo cute, I like the name Rosco or Tavis for a boy dog. Gorgeous, lovely blanket. Which pattern are you suing or are you creating one of your own? Every blog I've looked at so far today is reminding me about the blanket squares I need to do for the BBB. I must go and get some cotton. Puppies are awesome. If possible I would recommend getting some Grannicks Bitter Apple Spray and using it liberally to avoid skirting board etc getting chewed. It is brilliant, we used it everywhere and as far as I remember it didn't damage anything we sprayed with it. Love you blanket and your puppy is adorable! Your post cheered me up. Stay cheerful! The blanket is gorgeous and even more so your new puppy, looking forward to seeing how he grows! What wonderful reasons to be cheerful, that blanket looks so lovely and squishy. What yarn are you using, it looks so soft. How cute is your new puppy, good luck picking a name for him. When we got our cats the name choosing took quite a while as everyone in the family had a different favorite!!! We had to pick two out of a hat. The blanket is beautiful. 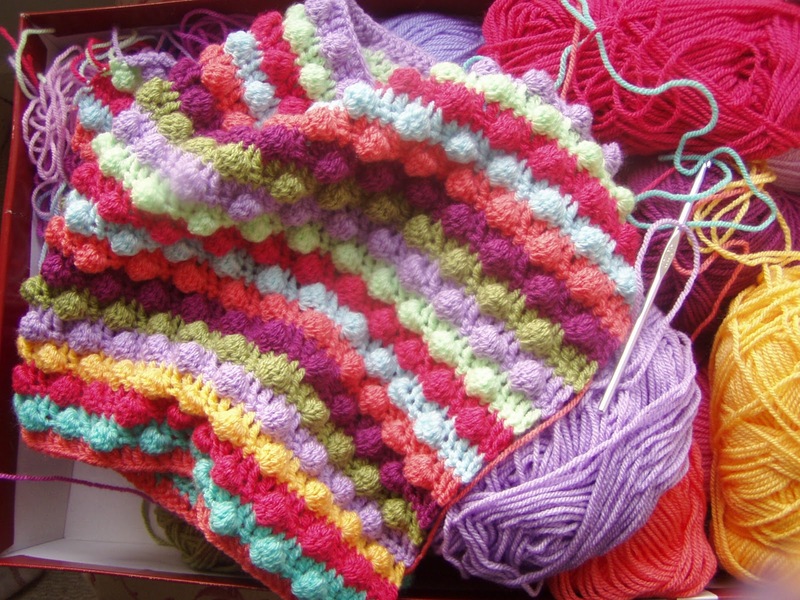 Are you using a popcorn stitch. I always thought that would work up to tightly for a blanket but yours looks beautiful. What a gorgeous puppy. What about the name buddy. I'm sure you'll find a name to suit him once he settles in and you get to know him. Your puppy is adorable. Lucky you. Oh and Mozart is a doggie name I like. What wonderful reasons to be cheerful..love the blanket its just so snuggly looking and perfect for a new little one. How cute is your puppy! oh my yummy..I like buster..our dog is called Sam, can't wait to see more pics of him. What a cute, cute puppy! No wonder you are cheerful. How about Rolf? It is kind of the sound Beagles make when they are doing their 'hound' thing. :) I bet your boys are just ecstatic!!! The blanket is wonderful too, of course. Many reasons to be cheerful and can't wait to see how puppy grows! Keep us posted, please! oh my goodness! beautiful blanket & gorgeous puppy! I'm not surprised your so cheerful. where did you get the pattern for the blanket from or is it one of your own designs? That puppy of yours is so beautiful!!! I'm so excited for you to pick him up!! He looks like a Chester or a Toby to me. Or a Frank. What a beautiful blanket! I love the puffy colourful stripes. When I hear "beagle" I immediately think of Snoopy. Not really the best name, but a favourite character. Your little guy is adorable. I love light streaming through windows too. Our house has very old glass in the windows, and it makes lovely wavering shadows on the walls. No wonder you didn't have to search for cheerfulness! And very exciting about your new puppy! I LOVE your baby blanket, the colours are scrummy! I wish I could pick and match colours as well as you can. Oh and how exciting, a new puppy. The smell of puppies and the smell of babies heads are definite reasons to be cheerful. I LOVE puppies! I'm going back for another look at that blanket, it is truely lovely. He is just adorable! Puppies are so soft and that baby blanket must be too! Lovely pattern and colors.